Seven Dials is our very own neighborhood English Pub, owned by Coral Gables native Katie Sullivan and British expat Andrew Gilbert. They serve American fare with a British twist and always have craft beer from local breweries on tap. If you are looking for amazing fish and chips, this is THE place to go. The first thing I noticed at Seven Dials was the fantastic and quirky wallpaper on the back wall. The wallpaper features a collage of animals: a skunk having a drink, a lemur playing the accordion, a hedgehog, an otter with a fashionable fan, and many other critters. The wallpaper uses dark colors giving the gastropub a vintage feel. I’ve also tried the Seven Dials burger and it’s amazing. 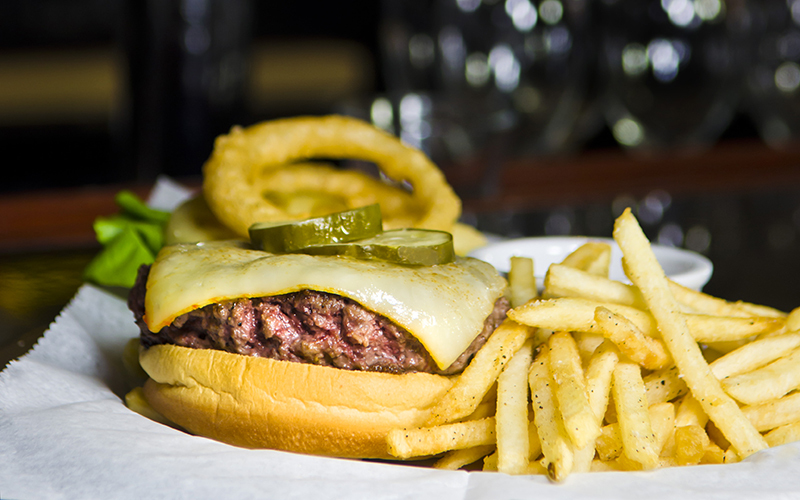 It’s served with muenster cheese, pickled green tomato, onion ring, marmite mayo, and house fries. Um, they had me an muenster cheese! It really is a super tasty burger. If you are a burger lover, the Seven Dials burger needs to go on your bucket list. For those looking for a classic British dish, give the bangers and mash a try. The sausages are from Proper Sausages butcher shop in Miami Shores operated by another American/British couple. The British style sausages are served with mashed potatoes and onion gravy. When it comes to dessert, DO NOT leave this place without having some. Their bread and butter pudding is simply amazing, served with creme anglaise sauce and golden syrup. I’ve also tried their ale cake. It’s a super moist chocolate cake served with melted fudge and a side of chocolate fudge ice cream. It’s the perfect option for all you fellow chocolate lovers. Seven Dials has happy hour Monday through Saturday from 5pm – 7pm. You’ll find $4 select beers and $5 charcuteries. Build the cheese and cured meat tray of your dreams. I’ve been to Seven Dials a couple of times and I really like the place. It has a cool atmosphere. Great place to grab a beer and have a talk with a friend. The food is really great. Even the little sides like the peas they serve have spices in them that make them unique and worth going back for!